Orbis Terrarum Tabula Recens Emendata et in Lucem Edita - STOOPENDAAL, D.
Title : Orbis Terrarum Tabula Recens Emendata et in Lucem Edita. Map maker : STOOPENDAAL, D.. Date : Amsterdam / Rotterdam, 1680. Size : 13.8 x 17.8 inches. / 35.0 x 45.3 cm. Description :World map from a Dutch bible of Daniel Stoopendael in beautiful hand colouring. 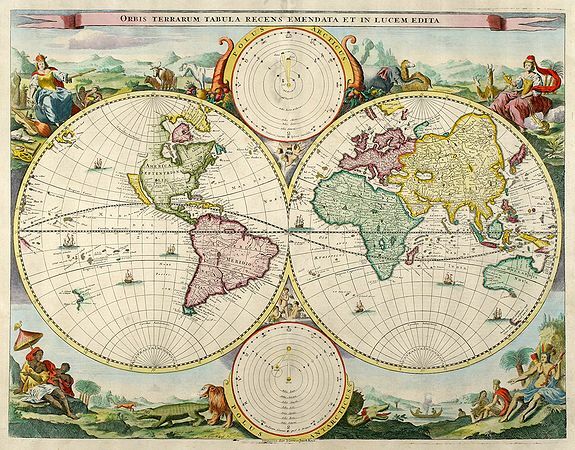 The map is based on Nicolas Visscher's map of 1663. Showing double-hemisphere world map with two solar charts, one centred around the sun, the other earth-centred. Surrounded with allegorical representations of the continents. California as an island. Dutch text on verso. Condition : One small tear and centrefold carefully repaired. Very decorative in good conditions.